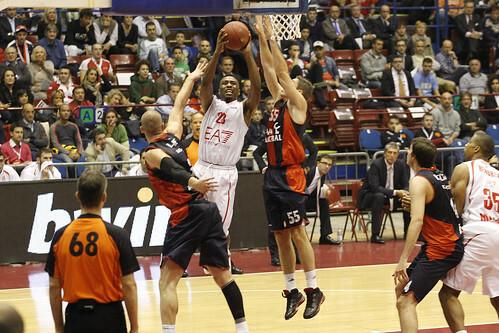 FIRST HALF – Olimpia is starting well, after a three-point play made by Keith Langford it’s up 7-2. Caja Laboral responds, makes a 6-0 run and it’s up by one before a Omar Cook three. The most difficult moment is taking place after a three by Maciej Lampe pushes Baskonia up 15-10. Langford reacts with a big three and Nic Melli ties up the score at 17 with another three-pointer. Alessandro Gentile changes the offense a little bit when he enters the game: he drives twice, draws a foul (makes one free throw) and then scores with energy to close the first period up 19-18. The second starts with a corner three by Malik Hairston, but Caja is not going away and it’s up another time. Stipcevic forces a fastbreak, scores and draws a foul. When coach Ivanovic calls a time-out in the middle of the second, EA7 is up 30-24. The margin grows up in double figure (35-24) after two tip-ins by Ioannis Bourousis. Langford adds a three-point play. Caja found two goals by Nemanja Bjelica and a post-up play by Nocioni. Two free throw by Bourousis and two more by Langford keep Olimpia up by six, 42-36. But on a Nocioni drive, Fotsis is called with a foul, he complains about it and was sanctioned with a technical foul (his third). After four free throw by Nocioni, Bjelica makes a three: a seven-point possession is completed and Caja is up 43-42. After a time-out, Hairston scores on a drive. It’s 44-43 at the intermission. SECOND HALF – The first run, 4-0, is inspired by Langford and acrobatic, circus shot by Melli, drawing a foul, too. Hairston goes to work, scores twice on consecutive drives. Bourousis makes two fouls, one is offensive, but stays on the court with three fouls and scores again, with a lot of aggressiveness over Lampe. 55-50. Nocioni takes a foul by Hairston (third) and got injured hitting his neck on a teammate’s knee. He has to leave the court on a stretcher. Brad Oleson replaces him and scores seven points in a row, 57-57, while Bourousis (who already has 18) commits his fourth foul. Caja takes a three-point margin twice, but Gentile re-enters the game and is very aggressive offensively. He makes two free throws, draws the fifth foul by Oleson, completes a three-point play scoring on a mid-range jump shot and finally makes a huge bank shot at the buzzer. It’s seven points in a row for him: 66-65 EA7 entering the fourth. Fotsis makes a three, it’s 69-67 early. But Caja Laboral is on a roll, Nemanja Bjelica makes two threes, Lampe adds a Jump hook. Caja is up by four, Olimpia’s defense is having a letdown and the eventual 11-0 run is opening up an insourmountable lead. San Emeterio is taking the game by the horns in the end and after a three by Hairston getting EA7 within six points, he makes a huge three closing effectively the game.